John Wiley & Sons, Inc. has other profiles that focus on other area's of people development. 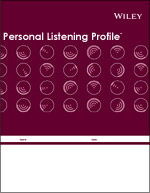 Outside of the DiSC Preview, used for introducing organizations to the DiSC theory, our profiles focus on listening skills, time management, and being intentional about putting teams together. Discover how you could improve in each of these area's below.